This antenna tuning unit (ATU) enables half-wavelength or longer wire antennas to be matched to the 50-? antenna input of 27-MHz Citizens’ Band (CB) rigs. The ATU is useful in those cases where a wire antenna is less obtrusive than a roof-mounted ‘vertical’ or ground-plane. It is also great for ‘improvised’ antennas used by active CB users on camping sites and the like because it allows a length of wire to be used as a fairly effective antenna hung between, say, a tree branch at one side and a tent post, at the other. Obviously, the wire ends then have to be isolated using, for example, short lengths of nylon wire. It is even possible to use the ATU to tune a length of barbed wire to 27 MHz. The coil in the circuit consists of 11 turns of silver-plated copper wire with a diameter of about 1 mm (SWG20). The internal diameter of the coil is 15 mm, and it is stretched to a length of about 4 cm. The tap for the antenna cable to the CB radio is made at about 2 turns from the cold (ground) side. Two trimmer capacitors are available for tuning the ATU. The smaller one, C1, for fine tuning, and the larger one, C2, for coarse tuning. The trimmers are adjusted with the aid of an in-line SWR (standing-wave ratio) meter which most CB enthusiasts will have, or should be able to obtain on loan. Select channel 20 on the CB rig and set C1 and C3 to mid-travel. Press the PTT button and adjust C2 for the best (that is, lowest) SWR reading. Next, alternately adjust C3 and C2 until you get as close as possible to a 1:1 SWR reading. C1 may then be tweaked for an even better value. No need to re-adjust the ATU until another antenna is used. In case the length of the wire antenna is exactly 5.5 metres, then C3 is set to maximum capacitance. Although the ATU is designed for half-wavelength or longer antennas, it may also be used for physically shorter antennas. For example, if antenna has a physical length of only 3 metres, then the remaining 2.5 metres has to be wound on a length of PVC tubing. 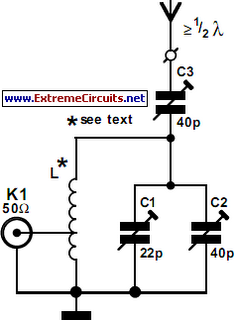 This creates a so-called BLC (base-loaded coil) electrically shortened antenna. In practice, the added coil can be made somewhat shorter than the theoretical value, so the actual length is best determined by trial and error. Finally, the ATU has to be built in an all-metal case to prevent unwanted radiation. The trimmers are than accessed through small holes. The connection to the CB radio is best made using an SO239 (‘UHF’) or BNC style socket on the ATU box and a short 50-W coax cable with matching plugs.